Ogilvie Fleet has overcome the “challenges and uncertainty” that exist in the fleet sector by refusing to standstill and continuing to make product investment to win a prestigious industry ‘Oscar’. 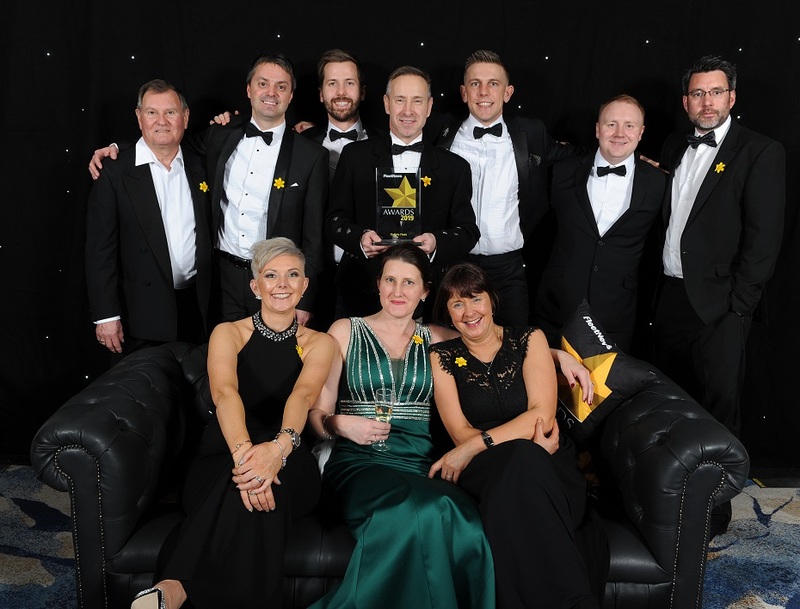 The Stirling headquartered company with offices in Sheffield and Belfast won the Leasing Company of the Year (up to 20,000 vehicles) trophy at the annual awards hosted by industry publication Fleet News. Ogilvie Fleet was also a finalist in the Customer Service Award category. Known as the fleet industry ‘Oscars’, the awards were presented at a glittering ceremony at London’s Grosvenor House Hotel hosted by BBC TV newsreader and presenter Huw Edwards and attended by around 1,300 people. Ogilvie Fleet operates an expanding fleet of more than 18,500 vehicles on lease and under fleet management including company cars and vans and models funded via salary sacrifice and Personal Contract Hire schemes offered by customers to their employees. Ogilvie Fleet has won more than 20 fleet industry awards since 2010 and previously won an industry ‘Oscar’, the Customer Service Award, in 2012. The Fleet News Awards are now in their 31st year and this year’s judging panel in making the presentation to Ogilvie Fleet called the company’s expansion in the past 12 months due to a significant number of client wins “impressive in a challenging market”. “Ogilvie Fleet has achieved good business growth in a challenging market. Strong testimonials and satisfaction measures demonstrate that the company is as passionate as ever about customer service,” said the citation from the judging panel, which was chaired by Christopher Macgowan, former chief executive of the Society of Motor Manufacturers and Traders. What’s more, in a fleet industry plagued by uncertainty due to a range of issues including Brexit, a failure by the Government to reveal company car benefit-in-kind tax rates from April 2021 and vehicle availability problems in the wake of introduction of the Worldwide harmonised Light vehicles Test Procedure (WLTP) emissions testing protocol, Ogilvie Fleet continued to introduce new and enhanced solutions to the market to the benefit of fleet operators and drivers. The judges highlighted enhancements made to Ogilvie Fleet’s ‘Happy Drivers’ App’, which provide drivers with a raft of in-life vehicle information that reduces the administration burden for fleet decision-makers; and the launch last year of its second app, called ‘APPraisal’, designed to help fleet managers and drivers overcome often contentious end-of-contract damage charges on company vehicles. The judging panel also praised Ogilvie Fleet’s approach to keeping customers informed on a range of issues including WLTP and its long-established record of customer service excellence that in the last 12 months has included client seminars with industry experts. The latest award follows Ogilvie Fleet late last year winning rival trade publication BusinessCar’s Leasing Company of the Year up to 25,000 Vehicles trophy for the second consecutive year. Gordon Stephen, managing director, Ogilvie Fleet, said: “It is fantastic that we are consistently winning fleet industry awards. It shows that the business is continually providing customers with the products and services they require. “Continually winning awards is also reflective of Ogilvie Fleet employing a great team of people and reinforces the superb job they are doing in terms of delivering customer service excellence. Without first-class employees that understand the market, our customers and the products and services available we cannot deliver.